Trust is never easy to gain nor should it be asked. And we know we’re on the web. That’s why you should think twice or maybe nth times before trusting any source on the internet. We thought that you need reasons to trust us, right? Here are some of them. Our team is composed of real RVers, not just writers and reviewers. We know that having firsthand knowledge in this field is one of the reasons that you should trust us. We’ve been working on our website to keep it updated and valuable our readers, mostly those who also go RV camping. 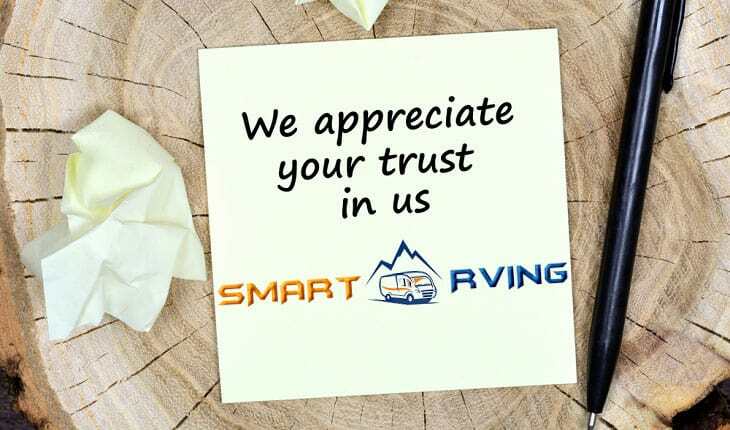 We know that there are many RV websites, but ours is one of the most trusted online. We don’t doubt why. We are able to fill a huge demand for RV information – correct and updated for that matter. Our website is slowly but surely becoming one of the top RV websites in the world. Thank you guys! We’re fulltime RVers, living in our trailers. We’ve been living our dream – these are the lives we always wanted. That is why we’re so confident that our reviews can genuinely help you pick the right RV products for your needs. But we’re not claiming that we know everything about recreational vehicles. As we said, we keep on discovering and learning new and different things about RVing and the RV life. Our main goal is to review RV products and provide the information you’re looking for. We’re going to add new content, guides and reviews on our website. Our team does not guarantee using each product we’re reviewing on this website. You know that is impossible and impractical. It also requires a huge budget, and we don’t have that kind of budget. But you can be sure that we have invested so much time into researching, writing and sometimes using a specific RV product. In some reviews, we had to ask questions to the manufacturers themselves. We do call them up to find certain specifics we could not find on their product descriptions. In some cases, we also reach out to our fellow RVers who have used a specific RV product themselves. We’re reviewing professionals not because of any badge or certificate of some sort to prove it, but we’re real RVers. And we’re passionate, driven and motivated to educate and become the best source of RV information online. We absolutely love what we’re doing, how we’re helping and how you’re making us feel you trust us. We’re no superhero of some sort to become great, but we’re simply humans who love RVing and helping fellow RVers for that matter. We’re on a mission and dedicated to be your one-stop, most comprehensive RV website to rely on. How do we earn if we’re fulltime RVers? We’re not wealthy or born from a royal family. Of course, just like anyone else, we need to make a living. We need to eat and survive. But using our website, you won’t pay a single cent. Then, how do we make money from this website? Our website is an Amazon Affiliate Website. It means that Amazon will give us a small commission when you click on a link on our website and you purchase that product on Amazon. Buying an RV product on Amazon using our link, you don’t pay extra. You pay the same cost that you would when buying directly using an Amazon link on their website. We’re using Amazon products in the reviews because it sells virtually all the things we need for our RVs, but then we don’t have to purchase or ship an item. But when Amazon does not sell a specific product, we become affiliates of the manufacturers. If we cannot become their affiliate, we’re not getting commission when you purchase from them using the link on our website. Ask us anything about RVing. We’ll try our best to answer your question as much as we can. We also welcome your feedback and suggestions. After all, we created this website for you and the rest of the RVing community. We do hope you will pick up valuable information on our website to find the right RV gears, accessories or tools for your recreational vehicle. For any questions, suggestions and concerns, feel free contacting our team today!